In Chicago there are farmers’ markets galore on every day of the week, but for us, market day is on Thursday. Beginning in May and lasting through October, I spend Wednesday evenings preparing every possible lunch, cup of coffee and back pack for the next morning so that there will be time to dash off to the Lincolnwood Farmers’ Market before school or camp. Now if you think it’s hard to drag four kids along to buy a bunch of fruit and vegetables, then you’ve never met the Honey Man. There’s one at nearly every farmers’ market, but we have an affinity for our Honey Man because his booth includes a photo album of his bees, all housed in recycled buses. Upon arrival, my kids line up at his booth with puppy dog faces, waiting somewhat impatiently for him to finish with the other customers. And when it’s their turn, he hands each kid a sampling spoon and puts dots of the best-tasting raw honey you’ve ever tried. Each type is pollinated by bees with different flowers, giving some of them tastes that explode in your mouth. Then there are all the flavored honeys, with raw extracts of cinnamon, cherries, strawberries, raspberries, you name it. Between our granola, challah, and snacking, we go through at least one bottle a week. Honey might be what gets my kids out of the house on time on Thursday mornings, but it’s the fresh fruit and vegetables that I crave. It’s not unusual that the fruit farmer is selling fruit that was picked THIS morning. You might think that this doesn’t make difference, but I promise you, it does. An apple picked today might as well be a different species from an apple picked two weeks ago in Washington and shipped over the Rocky Mountains. And the peaches? I buy two baskets each week and have to restrain my kids from eating only one peach at a time. The vegetable booth features nearly every vegetable you’ll need (you’ll have to go elsewhere for your tropical produce!). I never plan a Shabbos menu during farmers’ market season and instead cook what ever veggies are fresh and available–making the meals more fun and better tasting. I know what you’re thinking–Is it more expensive? It depends. If you bargain shop for produce, then yes. But if you like to buy what you buy because you like it, and you want your food to taste as good as it possibly can, then no. When you see your kid eating swiss chard because it is indisputably delicious, that’s priceless. And if you’re a skeptic, then try it and only buy a little. Most likely, you’ll be back for more. 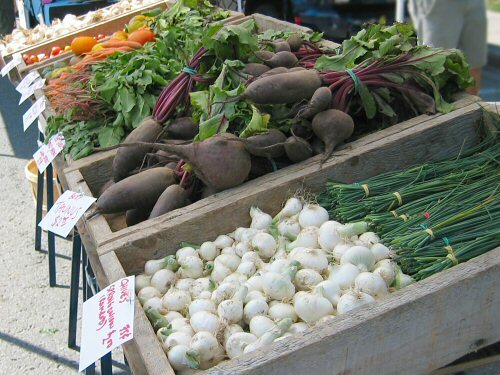 Here’s a list of the Farmers’ Markets near our home that we’ve tried. And here is a list of all of them. Happy Shopping! Skokie: Mornings in the library parking lot. This is the largest one that’s really close by, but who needs a bunch of produce on Sunday? Lincoln Square: Mornings at the “L” station, near Western and Lawrence. This is also a really large and good market, if you can tolerate driving down Lincoln Ave. for that long.